Pentax's original DS Mobile was focused entirely on delivering the ability to scan documents and pictures on the move. At about the size of a small umbrella, it was unapologetic about putting convenience ahead of ultimate image quality. The DS Mobile 600 is the same size and weight as the original, but doubles scan quality to 600dpi. It still connects via USB, which stays on message as far as convenience is concerned. Setup is easy enough - the supplied DSMobile SCAN software installs quickly and is launched by pressing the single button on the scanner itself. Of most use here is the ability to scan straight to PDF. Also bundled is PageManager 7, which includes an OCR utility and allows easy conversion between formats. 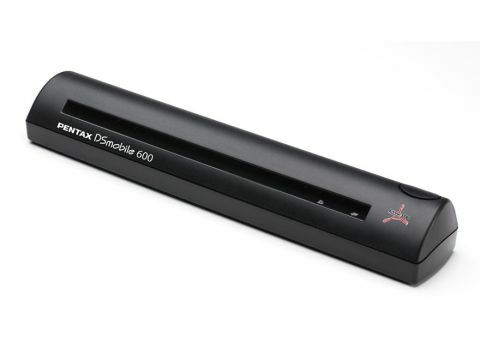 Despite its improved 24-bit colour scan quality, and Pentax's own photographic pedigree, the DS Mobile 600 is at its best as a portable document scanner. The unit is discreet and quiet in operation, and could happily be called into play to scan documents during a presentation. Each page needs to be fed manually, but this is a simple, albeit slow, process. Photo scanning was less impressive, despite the improved resolution. The DS Mobile 600 comes with two photo sleeves, but our scans were noticeably grainier than the originals and certainly no match for a decent flatbed. Some tweaking of the settings helped, but not enough to make it worth considering a realistic first-choice photo scanner. And while we understand Pentax focusing on its improved colour scanning in promoting the DS Mobile 600, it's only when considering its portability that this becomes an attraction. As a document scanner, however, we have few reservations at all. It's quiet, lightweight and easy to use, which is exactly what you need when scanning on the move.